After you defeat Misty, you should head north from Cerulean City. Your rival, who now has four Pokémon, blocks the bridge. So do six other trainers. If you can defeat them all, you'll receive a valuable Nugget and the freedom to travel to the end of this path, where you can meet the world's greatest Pokémon enthusiast, Bill the Pokémaniac! Once you've beaten your rival, you can cross Nugget Bridge by beating the six Jr. Trainers blocking your progress, they will each challenge you to a battle. When you've defeated them all, they will let you pass. Fools Gold: Note the Rocket at the end of the bridge. As you step in front of him, he will hand you a Nugget, an item that sells for 5000. However, this particular Nugget can be obtained more than once (not in Yellow or Blue)! All you have to do is lose this fight! So set up a party with a very weak Pokémon (perhaps the Magikarp available at the Mt. Moon Pokémon Center) and step in front of him. He'll hand you the Nugget, then fight you. If you have a level 5 Magikarp, you'll obviously lose. You'll be sent to the Pokémon Center. Cross Nugget Bridge again, and he'll stop you again. And hand you another Nugget! On the other side, Yellow players will find a man (at the yellow A) who wants to give a Charmander a good home (such as your team), while Blue and Red players will only find TM45, which teaches Thunder Wave. It's a great paralysis inflicting move with perfect accuracy. Defeat your rival once more! You'll meet a familiar foe at the beginning of Nugget Bridge. Your rival is back, and this time he's actually improved enough to pose a small threat. Your original party will work fine against your rival (Pikachu, your starter in its second evolution, and Spearow). Make sure they are all Level 16 or above. Lead with Pikachu and zap Pidgeotto out of the sky; 1-2 Thundershocks will do the trick once again. Use your lowest-level Pokémon (that you actually want to train) against Abra: it can't do anything to your Pokémon at all, so it's basically free EXP. Rattata is hard; its STAB Quick Attack and Hyper Fang can cause problems if allowed to go unchecked. Use your strongest Pokémon available on Rattata. Finally, use Spearow's Peck against Bulbasaur, Pikachu's Thunder Wave and Quick Attack on Charmander (Thundershock gets a little more power with STAB, but Quick Attack runs off of Pikachu's higher Attack stat and hits Charmander's lower Defense stat), and Pikachu's Thundershock against Squirtle. You can use the same party of Spearow/Pikachu/Mankey that you used previously and be victorious, but it's easier if you make another acquisition. Get Bulbasaur from Cerulean City, train it on Route 4 to Level 13 to have it learn Vine Whip, and prepare for a sweep. Pikachu leads against Spearow and Thundershocks it into oblivion. Use Bulbasaur and its Vine Whip against Sandshrew, and use Mankey against Rattata. Just make sure you're using Low Kick and not Karate Chop. Eevee will fall to Low Kick as well. Spearow is your backup: if a Pokémon (maybe Mankey; frail defensively and two enemies to defeat) falls, use the bird. The best item to get here is TM19 on Route 25. There's a tree blocking it again but there is a way in getting it earlier. You'll need to be crafty to get it: be at least three squares below the Jr. Trainer (#7 on the map) who's blocking it when you cross his line of vision, and he'll abandon his post to come fight you. Immediately after, loop behind him and grab it. If you weren't able to succeed, you can always come back later to the spot to have a Pokémon cut down a tree blocking the area. TM19 holds Seismic Toss, a Fighting-type move that does damage equal to the level of the Pokémon using it to an enemy regardless of their type or Defense. It can also hit Ghost-type Pokémon, which are usually unaffected by Fighting-type attacks. You'll also find an Elixir if you examine the wall in the space above the first hiker (walk 2 squares east and 2 squares north of trainer #1 on the map). Note: The Youngster (#4 on the map) on Route #25 is crucial to the performance of the Mew glitch and should be not be challenged until you are ready to perform the glitch. 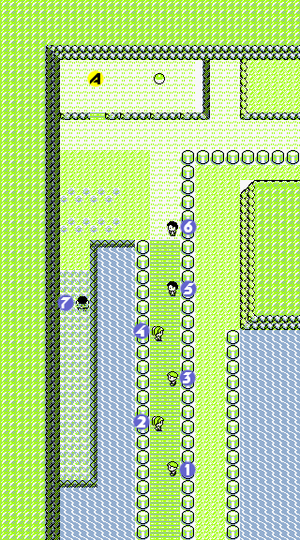 The Jr. Trainer (#7 on the map) on Route #24 can also be used to perform this glitch, depending on which method you choose to use. Bill has a problem. Help him out by going to his PC's keyboard and doing what he asks. Yellow players can enjoy some amusing Pikachu antics as well. Once he's rewarded you with an S.S. Ticket, exit the cottage and enter again. Check Bill's PC once again for information on four rare Pokémon. When you're done, take the shortcut (go south from the cottage) back to Cerulean City (or for a faster way if playing on Red or Blue, use an Escape Rope inside Bill's house back to the Cerulean City Pokémon Center if it was the last place you healed) and go to the house that's guarded by a cop. Head on through it and fight the Team Rocket burglar (his roster is in the table to the left). Knock him out and recover TM28, containing Dig. Dig is a decent Ground-type attack that can be learned by Sandshrew, Geodude, and even non-Ground Pokémon like Squirtle, Charmander, Rattata, and a couple of others. In battles, it does a ton of damage with a 100 power base, though it's unfortunately delayed by a turn, during which point you're invulnerable but this gives a opponent a free turn to do what he/she pleases such as switching out Pokémon (most likely a Pokémon that can resist Ground-type moves) and using stats boosts. However, when used outside of battles, you can use it to escape from dungeons (oddly, even some buildings allows Dig to be used)! While in town, you can sell your Nugget for 5,000 (that's all it's good for) and then cut through the burgled house's yard and head around Cerulean City to the south. You've got a ship to catch. Bellsprout can thoroughly thrash your opponents early in the game, since they get the Wrap skill at level 13 and have the Rock and Ground-type beating Grass-type attack, Vine Whip built right in. Their next couple of skills are all Poison, Sleep, and Stun moves. Sleep Powder and Stun Spore are both useful for helping you catch and battle Pokémon, so Bellsprout is a good choice if you didn't pick a Bulbasaur early on and you need a Grass-type. Abra is notorious for being quite difficult to catch. The only move they know is Teleport, which removes them from battle instantly. So if you're lucky enough to see one in the wild, you've got one turn to snag it. You have a few options: one is to have a Jigglypuff or Clefairy Sing it to sleep if they are faster that it, or use Sleep Powder if you have Butterfree, which makes it easier to catch and also gives you an opportunity to knock it around a bit while it's dozing. The next is to use Wrap to squeeze it until it's weak enough to catch, while keeping it from Teleporting away. The last option is to use Pikachu's Thunder Wave to paralyze it and capture it right away with a Pokéball (though this option isn't very reliable, as Abra would still have a chance to use Teleport right away). Also, if you are lucky enough to have an Ekans, you can Wrap Abra before he teleports. It will disable his teleport ability and only deal 1-2 damage. You can also interrupt Wrap by either switching Pokémon or throwing a Pokéball. Since Wrap deals very little damage and Ekans can become faster than Abra, I recommend catching an Ekans if possible an using Wrap to hold Abra in place. Once his health is low enough, he will be a steal. But are they worth it? Definitely, since Psychic Pokémon are the best in the game, and Abra evolves into the best one you can get (before the game ends, that is.) With a very high special and a great speed despite its pathetic Health and defense stat, Abra and its two evolutions are one of the most ferocious special sweepers in the game (more like a glass cannon). At level 16, Abra will turn into a Kadabra, which you can (and should) immediately trade to a friend to evolve it into a powerful Alakazam. Even if you don't, however, the Confusion attack Kadabra learns, combined with the Same-Type Attack Bonus (STAB) it gets, grants even a level 16 Kadabra the ability to knock out almost any Pokémon of comparable level in one hit, even without type advantage. It will then progressively get more powerful Psychic-type attacks in the game such as Psybeam and Psychic, both which will allow Kadabra/Alakazam to hit even harder. Don't worry if you're playing Red: there may not be any Bellsprouts, but you can still get a decent Grass-type by catching an Oddish. Oddish's initial Absorb skill puts Leech Life to shame, and since it's Grass-type, one Oddish can take down dozens of Water, Rock or Ground-type Pokémon, healing as it goes. Like many other Grass-type Pokémon, it can also learn useful status inflicting moves such as Stun Spore and Sleep Powder. You'll need a Leaf Stone to reach the final stage of evolution, but keep in mind that it learns powerful moves like Petal Dance, Mega Drain, and Solarbeam later on. Available here in Yellow only, Venonats are quite rare, but hardly worth the trouble. It's just another Bug/Poison thing, albeit one that can learn good Psychic-type moves later in the game. This page was last edited on 18 November 2018, at 19:51. This page has been accessed 1,162,643 times.